5/14 -Brunch & A Mixtape Mother’s Day Edition SF w/ Eats by E.
https://djneilarmstrong.com/wp-content/uploads/adobo-hash-e1494103415699.png 333 500 djneilarmstrong https://djneilarmstrong.com/wp-content/uploads/logo-transparent-300x76.png djneilarmstrong2017-05-07 18:08:272017-05-20 14:06:195/14 -Brunch & A Mixtape Mother's Day Edition SF w/ Eats by E.
This is the City Edition of the 1 Year Anniversary of #apartycalledrosieperez, for those who couldn’t make it to BK this past Saturday. As always @davefotogram on flicks. 5 Bucks in advance, 10 bucks at the door. Be cheap dammit. We bringing those west coast vibes back east. Dre Day Tampa 2017 is going down at The Bricks YborTHIS SATURDAY. This one is a no brainer tampa. If you missed Valentine’s day with your #Sidepiece, you can make it up as we will be playing #SidePieceValentine‘s for the first time down here in Tampa. OR you can bring your wife / main piece… we won’t tell. We’ll also be playing #Stillnonstop” during the nite, AS WELL AS DEBUTING the Tonkatsu Appetizer. You will have the opportunity to purchase Still Nonstop and SidePiece Valentine’s on Cassette USB with the chance to get a complete digital DL of my Mixtape Library. On Saturday, Feb. 11, check out Dinner & a Mixtape w/ DJ Neil Armstrong (NYC) at Kinki as part of DJ Neil Armstrong’s worldwide series of events, sharing his love of #music and good #food with #Ottawa patrons. Local chef favourite Caroline Chico Cichelly (from Chico’s Hip Hop Brunch) and her talented kitchen crew will curate the special featured menu while DJ Neil Armstrong plays music from a new installment from his Mixtape Library. FEB 10th FRIDAY – I’ll be djing in the ByWard Market at #ByWardBeats at 70 Clarence Street Loading Bay (across from Luxe Bistro) at 7:30-10:30pm. #ByWardBeats is a FREE event open to the public every Friday and Saturdayduring Winterlude at 70 Clarence Street (Clarence parking garage loading bays) from 7:30-10:30pm. A new experience in an urban space, lights and sounds transform winter corners into lively music-filled public spaces. Dinner & a Mixtape has partnered with local chef favourite – Jonny Blonde from Jonny Blonde Food Truck & Kitchen, and his talented crew to curate the special featured menu to be released soon. We will also be featuring an afterparty and late night menu by Manny Ferreira and his team at Uno Mas / Mezcal TNT. Neil will be joined by local DJs TBA. Cover: Free entry 6-8pm. $7 after. Third set TBA: 11:00pm to close. EMPANADAS – flaky butter pastry emapanadas in two style with two sauces. one will be Butter Chicken, the second a surprise. OG SKEWERS – two styles of jonny’s og grilled skewers & sauce. one will be vegan, one meat & veg. WINTER SALAD (vegan) – seasonal veg & jb’s dressing. RUDY’S PALETAS (vegan frozen fruit on a stick) – plan b farm organic concord grape | raspberry vanilla coconut. After Party at Uno Mas with Late Night Menu by Chef Manny F to follow. Free entry. After Dinner And A Mixtape @ Junior, we work off them calories with some good music. Served on a traditional banana leaf lined plate. Adobo Manok, Pancit Bihon, Lechon Kawali, Jr. Lumpia, Bok Choy and Steamed Rice. 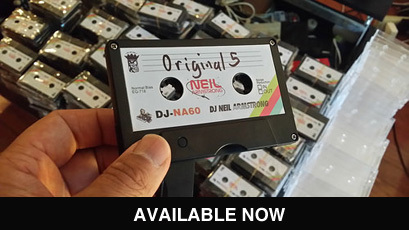 Limited edition Cassette USB mixtapes will be available for purchase, as well as the opportunity to download the ENTIRE DJ Neil Armstrong Mixtape Library for FREE. Good eats, Good Beats, Good People. 2017… let’s get this started off right. For reservations, head to http://bit.ly/kilokallangreservations – Choose Jan 12th as the date, reserve anytime after 6 PM. DJ Neil Armstrong back in the +65 with his Dinner & A Mixtape series happening at Kilo. Join us for Kilo Kallang x Matteblacc present: Dinner & A Mixtape next Thursday JAN 12th. Limited seats available, so book now! Started in 2013, Dinner & A Mixtape has been held in New York, Hong Kong, Toronto, Los Angeles, San Francisco, and Manila, Philippines, among other places. The idea is simple. Food and Music are similar art forms that go hand in hand. The ability to take sound and manipulate it into a beautiful song is very similar to how a chef takes ingredients and turns a plate of food into a work of art. DJ Neil Amstrong’s interest in both led him to create the concept of joining the two together into one event. Thus was born, Dinner & A Mixtape – a play on that classic American “date night”. Instead of Dinner and A Movie, you get dinner and great music. The soundtrack is provided by a new installment in DJ Neil Armstrong’s mixtape library. Part eating experience, part listening session: the food nourishes the body, and music feeds the soul. Attendees also go home with a copy of DJ Neil Armstrong’s latest on cassette USB, giving diners the opportunity to bring part of the experience home with them. Located by the picturesque Kallang River, Kilo serves Japanese- and Italian-inspired comfort food with a cosy, laid-back ambience to help you feel right at home. Meant for sharing, let our food and airy, open space take you away from the concerns of everyday life. Indulge, slow down, and take your time to catch up over a hearty meal, then join us in the Lounge on the 8th floor for some gourmet drinks to unwind. Here at Kilo, good times, soulful food, smooth music, and heartfelt conversations meld. Welcome, and we hope to see you by the river soon.